Oh, this alphabetical bloggy thing is a hoot sometimes. Often, while browsing the blogs of photographer friends here on WordPress, a photo will beg to be painted. This one, from Bella Remy Photography, was such a photo, combining one of my favorite flowers and favorite birdies all in one go. I had lots of fun interpreting this photo fairly loosely in ink with a superfine Pitt Artist Pen (thanks again, Faber-Castell), and then going over it with the help of my watercolor palette. It’s not often that a page in my art journal looks this colorful, but I couldn’t resist lighting this one up with pigment. Thank you Bella, for knocking it out of the park once again! The paint doesn’t flow nearly as freely in my journal as on watercolor paper, but man I love that thing. I used to fill one page a day, but lately, I’ve been drawing to my heart’s content, usually at night while watching the O’s, and I may go through four or five pages in one day. I just bought a new book (as this one quickly fills up), and I think I’m going to make it a goal to go through all 64 pages in a month. It will sound art geeky as all get out, but I’m looking forward to one day seeing a shelf full of art journals, filled with memories and fun! Lately, I’ve been enjoying drawing as much as painting, so maybe I should try and get a bulk discount on these things at Blick, lol. Happy top of the week to all, and let’s go out there and light up the world with color. Shall we? Spread smiles everywhere, Artinistas! We can do it! Peace and puddles of paint to all! Autocorrect changes it every single time. Ugh. The pen works so well with the feathers of the bird. Great combination and balance of line and color. and 64 pages in a month! Wow! I can’t stop! It’s like a giant snowball, rolling downhill. I’m enjoying it, although it blows me away constantly. Is this what the “change of life” really means?! Ok, I’ll throw in a little zen: “all life is change”. Wow, good point. But I’ve heard that women going through the change often find they have a skill they never knew they had (or in my case, definitely did not have)? hmm…maybe just more time in their life for themselves? You obviously always had this skill. I took art all through high school and I never got better than meh. Never had the gift. It is in the family, but I never had it. Color, yes, but never drawing. It’s very weird. I sometimes feel I’m in a dream. Much like when I contemplate Donald Trump’s candidacy. lol. Ah yes The Donald. At least he’s amusing. You probably already had someone in the role of artist in your family. Or your art teachers didn’t know what to do with your particular gift. I’m not saying that anyone can do anything, but these things don’t just magically appear. I look at myself now and see so much that was untapped, unseen, unexplored when I was young. I just needed the right key to unlock it. Well…better late than never! Love the combination of loosely drawn and loosely painted! Thanks Beverly! This was so much fun! I think you have quite the knack for Coneflowers! Thanks, Sharon! That’s one thing I definitely have plenty of over here. I’m glad I brightened your morning, as you brighten so many of mine! Your daily practice is paying off! This is lovely. I love your cone-flowers, and the colors in this interpretation. Thanks, Jill! Lately I’ve been gravitating to ink, especially with the birds I’ve been sketching. Can’t resist adding some color here and there! I’m glad you like this one – it was fun and lots of color, right up your alley, lady! I hope your day goes smoothly – have you already been chosen, or are you going there hoping you won’t be? I always get called, Vic never has, and wants to be! He’d love to be on a jury too! I’ve never been put on a jury because years ago I worked for an attorney. That seems to scare the lawyers away from me. lol. I wasn’t chosen today – thank goodness! Probably because I was prepared to draw in my journal. LOL! I’m religious so I tend to believe it’s from God. I know that I never had any kind of artistic talent before. I could make quilts, so color, ok cool. But painting, drawing were both out for me all my life. In spite of four years of art in high school! Nice combination of pen and watercolor. Daily dedication will take you there. I see the progress in the short period I have been following your work. Onward….and what is not to love about Strathmore mixed media! Right? You can’t beat those journals! You can throw anything at them and they hold up great. And $6? A no-brainer for me. I’m glad you’re seeing progress, Carmel, and thank you for telling me that. I appreciate it. Thanks, Myriam! I’m practicing for Draw a Bird Day. I hope you’ll be joining us again? I totally loved your July work. Thanks Laura :-). Yes, I’m see-sawing between a few August bird contenders. Speaking of birds, I took a closer look at your avatar just now. It is a ring-billed gull right? Very cool shot. The wing has an interesting curve to it. I’m enjoying your watercolor excitement. You’re getting really good! I think so, yes. I was lucky to get that shot. Hub was throwing bread crumbs so I could get birds in flight. I was determined to draw them when we were at the beach last October. Last August is when my whole art obsession thing started. Lol. Oh, thank you. It’s a very very slow process, but I’m enjoying it. Maybe this is why I’ve been drawing so much lately. I feel I can make progress more quickly in that avenue. I love color but controlling the flow of the water and gauging it isn’t really my strong suit. I’m glad you see some improvement! I do feel like I’m starting to find my own loose style. I suppose most bird photographs are lucky, unless someone has a trained bird. Sweet of Hub to support your gull photographing adventure :-). Maybe if you keep playing with watercolors… in a year or two… water flow will be your strong suit. You definitely seem to be discovering a lot about it. Woo. Not sure I have the patience! But if it keeps calling, I’ll keep picking up the phone. lol. Nice! I like that the color extends beyond the lines. 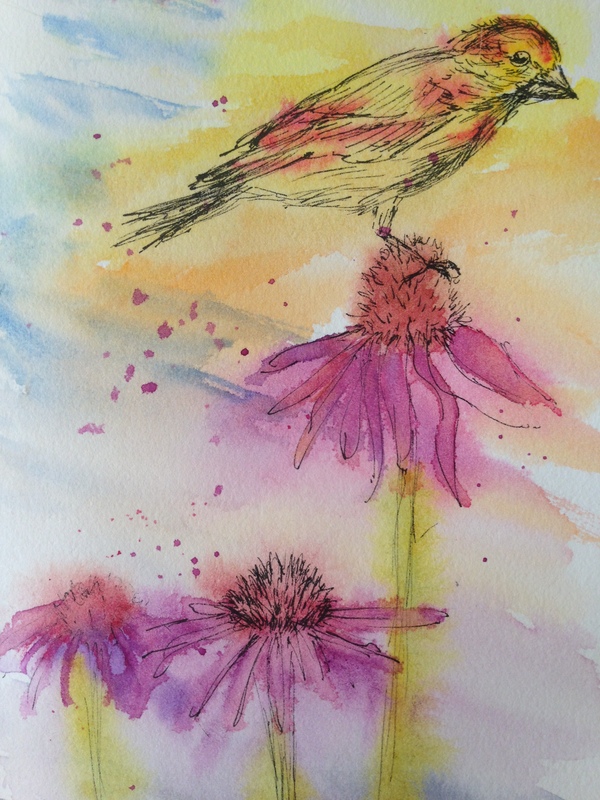 Love how you painted the cone flowers and the bird. Beautiful ! Thanks my sweet! This is the one I redid today on WC paper. I like that loose free feeling in my painting style. It’s taken awhile to develop and I’m hanging on to it like grim death lol! I know, I just say “Charles Reid tutorials”… 😉 Love that loose style too, I´m trying to achieve that now after watercolor in my oilpaintings too. I love both of these compositions – this one feels like early dawn to me in summer, waiting and watching for the day to come. The other feels like fully sun-filled day, alive with celebration. Both are beautiful in their own way.